Interstate 65 bisects the Volunteer State from Elkton north to Mitchellville. The 121.71-mile joins Nashville with Birmingham, Alabama to the south and Louisville, Kentucky to the north. 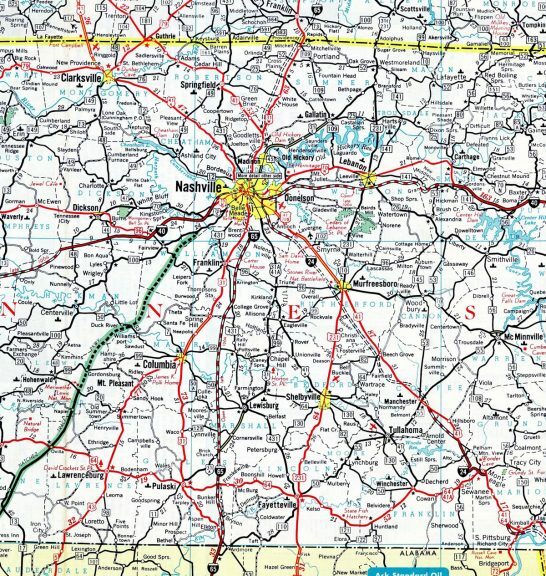 Suburban expansion of the capital city stretches south along I-65 to Franklin and Spring Hill and north to Hendersonville and Millersville. Growing traffic demands result in expansion and redesign of the commuter freeway both south and north from Nashville. Expansion of I-65 between Tennessee 840 and a point north of Tennessee 2482 at Franklin added four overall lanes for a 4.096-mile stretch. Work included redesign of Exit 61 to a Tight Urban Diamond Interchange (TUDI) with SR 248 (Peytonsville Road east / Goose Creek Bypass west) and expansion of the east-west route. Work there runs from August 30, 2013 to June 2016. The short stretch of I-65 completed in 1958 tied into U.S. 31 leading north to Pulaski from Athens, Alabama. 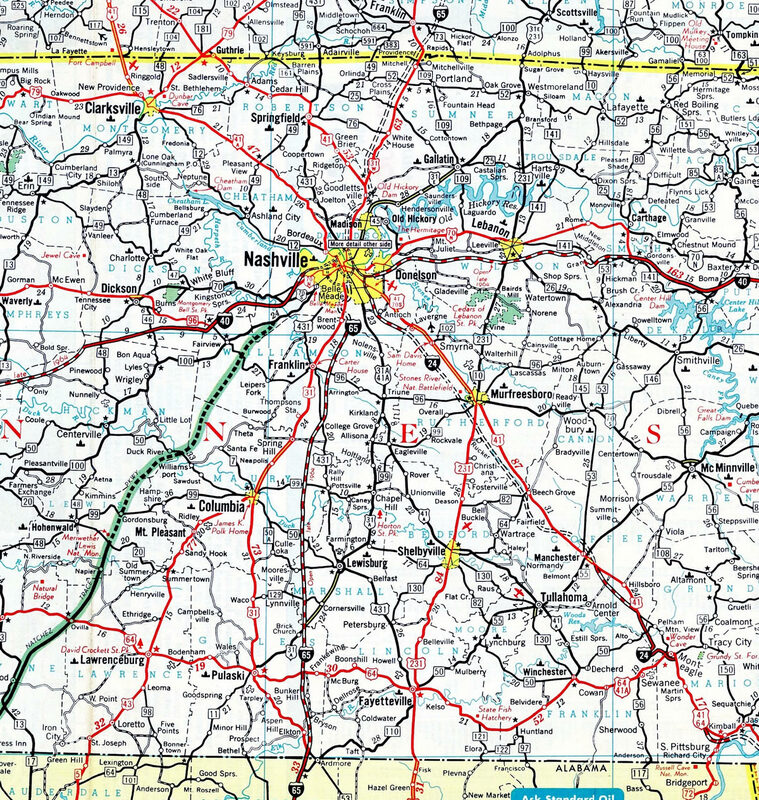 The remainder of the route north to Davidson County was under construction by 1964. North from central Nashville, Interstate 65 was expanded partially from U.S. 431 (Trinity Lane) to Tennessee 386 (Tennessee Veterans Boulevard) in the late 1990s. A $50-million project completes the freeway widening between Trinity Lane (Exit 87) and U.S. 41 (Dickerson Pike).3 The ten-lane expansion commenced in October 2012. Work includes adding lanes to the ramps with I-24 and the installation of 14 noise walls. Construction wraps up in May 2016. Rivergate Parkway meets Interstate 65 at a parclo interchange (Exit 96) between Goodlettsville and Rivergate Mall. Pictured here is the southbound on-ramp to central Nashville. Photo taken 11/04/09. Passing under Interstate 65, Rivergate Parkway south approaches the northbound on-ramp to Louisville, Kentucky. Photo taken 11/04/09. Rivergate Parkway constitutes a crowded commercial corridor from Interstate 65 southward to U.S. 31E (Gallatin Pike). SR 386 (Vietnam Veterans Boulevard) crosses over the arterial, east of from I-65 north at Exit 95. Photo taken 11/04/09. "Facts About Tennessee's Interstate System 50th Anniversary, 1956-2006," Tennessee Department of Transportation, 2006 web site.